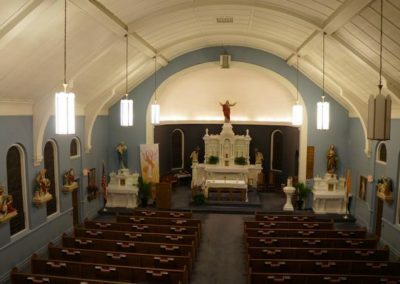 Since its establishment in 1879, St. Mary Church has served a burgeoning Catholic population in Northern Texas. After a fire destroyed the original building in 1920, Fr. 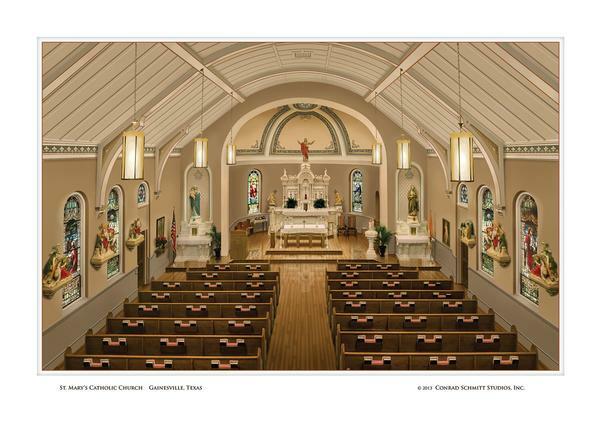 James A. Kealy spearheaded efforts to create a beautiful new space for his congregation. This included stained glass windows from Germany and Stations of the Cross from England. In the summer of 1984 the church received its first major remodel, which added a new vestibule and restructured the sacristy to include a bathroom. 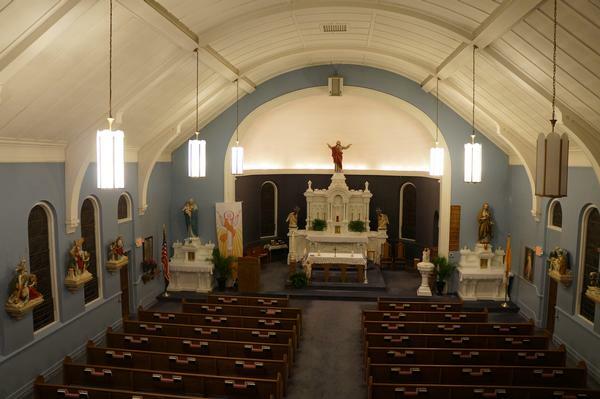 At that time, the parish also added a new roof, oak pews, lighting, carpet, sanctuary furniture, and new doors. 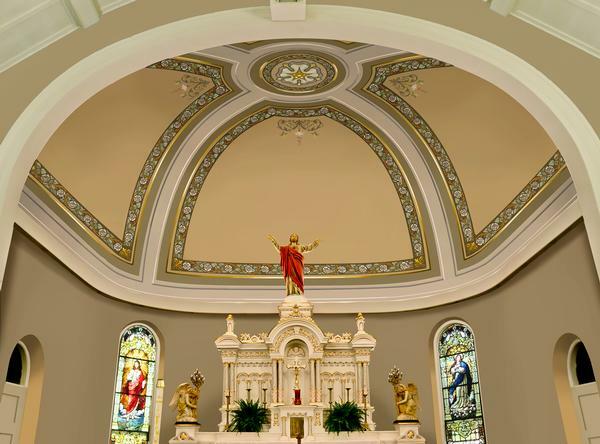 In 2013, the community at St. Mary’s sought to protect their church’s priceless stained glass windows and provide a much-needed update to the interior decoration. Conrad Schmitt Studios was contracted to install protective storm glass to the exterior of the stained glass windows, and to restore stained glass panels in the operating window vents. The existing plastic and aluminum exterior window covers were removed and replaced with 1/4″ laminated safety glass. The ventilator panels were then removed and transported to Conrad Schmitt Studios, where they were documented and dismantled. Broken pieces of glass were cleaned and repaired or cleaned and replaced. After the windows were re-leaded, new reinforcement bars were installed. At the time of reinstallation at St. Mary’s Church, 3/8th screened brass tubing was included to vent the airspace between the stained glass and the exterior storm glass, offering protection from condensation. After the stained glass installation, CSS decorators began on-site samples of the selected decorative scheme. Colors and motifs were outlined in digital renderings and presented to the client. The existing monochromatic paint scheme failed to take advantage of the architecture. CSS added several paint effects to increase the perceived size and architectural complexity of the space, such as trompe l’oeil arches around the dome. The dome also features the Marian symbol of the Mystical Rose. Decorative panels were painted at the side altars to add verticality and highlight statuary. Gilding now accentuates the carved details in the altar and side altars. 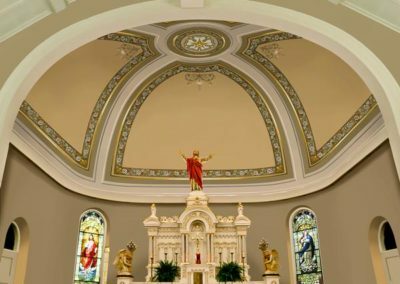 The final result reinvigorates the interior of St. Mary Church, providing a worship space worthy of her dedicated community.